Men & Monsters of Ethiopia is a supplement for 5th Edition Dungeons & Dragons based on the legends, lore, and history of the African nation. While it of course includes new monsters, it also explains how a number of existing monsters would fit in to an Ethiopian setting. Included as well are sections on local religion, animals, and NPCs—stat blocks for five new types and background information on the roles filled by both these and standard D&D NPCs. 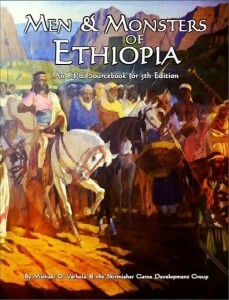 Men & Monsters of Ethiopia is a 50 page ebook from Skirmisher Publishing available for $7.49 via DriveThruRPG.